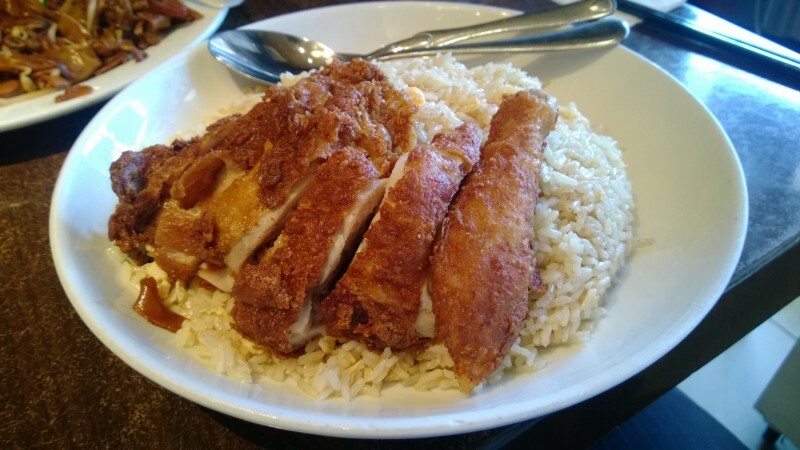 A little while ago, Albee’s Kitchen in Cabramatta shut down – much to our disappointment. Much to our delight however, there was a sign stating that a ‘new’ Malaysian restaurant (Albee’s was also Malaysian) was opening up soon. What this usually means is that the franchisees broke off from the mother ship and decided to head out on their own (the original Albee’s is still in Campsie). Sometimes this works well and sometimes it doesn’t. Other times it’s pure coincidence and on at least one occasion I know of it is the land lord taking advantage of the previous tenant’s popularity and forcing them out by jacking up the rent absurdly high then opening up their own similarly named and themed restaurant hoping that diner’s don’t notice the change and riding on the success and reputation of the previous restaurant. Well in this case, it’s Cabramatta and it is the first and only Malaysian restaurant I know of whereas Vietnamese restaurants are sprouting up every second day. Second they haven’t tried to mimic the old menu or shop name which makes me think the old crew have decided to open up their own restaurant but playing by their own rules. All dishes are now $9.90 which I think is generally a drop in price but perhaps a jump for others, not sure. 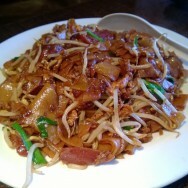 Disappointingly though the portion size for the char kway teow has dropped. I remember a single serve of this being enough to comfortably feed Maggie and I and we would happily pay an extra couple of dollars for it. I also remember there being a few more ingredients. It is good, but not as good as it used to be. The fried chicken and rice though was a real treat. 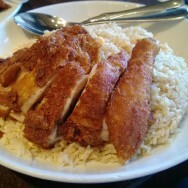 The chicken skin is salty and crispy while the meat is tender and falls off the bone. We receive a drumstick and thigh which is reasonable. 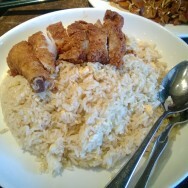 The rice is surprisingly satisfying – it has a smoky wok flavour and though I personally think there are few things more comforting than white rice and egg I just wish there was some salad or vegetables on the side even if token in nature. Rice and egg are delicious and filling but I’d rather have less filler and something to freshen it up a little. If you ever need a meal to keep you full for 12 hours then great – and it did in my case, much to my displeasure – otherwise, not great value for money. Standards have dropped a little I think, but because they’re fairly new a little time will help them settle in and smooth some things out. And because their menu is much smaller, we’ll come back to try some of the other items, but maybe not in a hurry.